The Home & Laundry Care market consists of four segments: Laundry Care, Household Cleaners, Dishwashing Detergents and Polishes, Room Scents & Insecticides, which will be discussed in this report. The worldwide revenue of US$127 billion in 2018 is expected to increase to US$135 billion by 2023. In the Statista Consumer Market Outlook Market Reports our analysts compile an overview of the segment and trends, market sizes, regional development, and key players. An overview of all Outlook Reports can be found here. Statista's Consumer Market Outlook presents the key performance indicators sales, revenues and prices of the most important consumer markets worldwide. Our specialized analysts’ market calculations are based on data from validated sources. The Home & Laundry Care market covers cleaning products for private households. In this report, growth potentials, market drivers, consumer insights, key companies, and future developments for three major Home & Laundry Care markets, North America, Europe and Asia, will be discussed. The market is divided into four segments: Laundry Care, Household Cleaners, Dishwashing Detergents and Polishes, Room Scents & Insecticides. 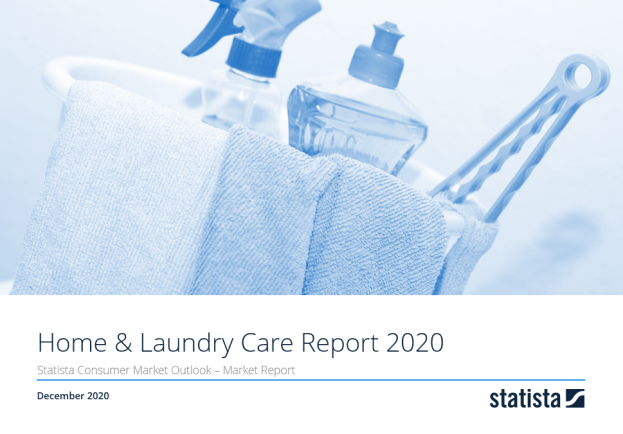 This report from the series of Consumer Market Outlook reports gives an overview of the Home & Laundry Care market from an international perspective. You can find further information on the topic on Consumer Market Outlook/Home & Laundry Care.